In a society obsessed with celebrities, baby Muffin’s death is big news. Was it cot death, or something more sinister? Everyone wants to know – including the police. The bereaved parents, celebrity couple Jodee and Chazz, live in curate Callie Anson’s parish, and Callie becomes involved with the funeral arrangements in spite of the disapproval of the vicar and his wife. Detective Inspector Neville Stewart is called away from his honeymoon to investigate the case, with disastrous personal results, and journalist Lilith Noone’s professional future is put on the line when she becomes embroiled in a dangerous flirtation with celebrity culture. Meanwhile, for police Family Liaison Officer Mark Lombardi, the death of baby Muffin is eclipsed by another fatality, much closer to home. He finds himself in an impossible position, torn between loyalty to his family and a growing love for Callie. "Callie’s troubles begin on a stormy windy night when her roof tiles begin to slide and tear her roof apart. It will take the roofer from six weeks to two months to repair it. She is forced to move into the vicar’s home next to the church where she is not particularly welcomed by his wife. While there a baby girl, the 3-month-old child of celebrities, is found dead in her crib. Detective Inspector Neville Stewart is called away from his honeymoon to investigate the death. The first theory is SIDS. Mark Lombardi, a Catholic who is in love with Callie, is the family liaison officer. He calls Callie since the parents lived within her constituency. The parents decide they want Callie rather than a priest to carry out official duties surrounding the baby's funeral. But there's something else: the baby had a hairline fracture in her neck, the possible result of being shaken too hard. About the same time, DI Stewart and Mark are notified of the death of Joe di Stefano, Mark’s brother-in-law, though there is a mystery surrounding his fatal heart attack. Mark is put on leave because of his family association. Mark’s niece, Chiara, being fond of Callie, leans on her for comfort in her grief. Mark’s sister, however, tells Mark in no uncertain terms that Callie to back off. If Chiara is to talk to anyone is it to be with her or their priest. Can the strain in Callie and Mark’s relationship be revived after Mark issues his sister’s ultimatum? And what will happen to Stewart’s marriage after he chooses his job over his new wife? 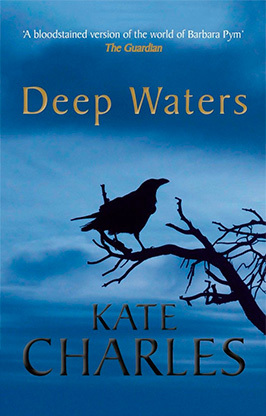 Deep Waters is an excellent mystery. Not only is the storyline compelling, but the characters have an emotional range that adds depth and interest for the reader, and the relationship between Callie and Mark is particularly noteworthy. There's also the subplot about celebrities, how easily they are popularized by the press and how quickly they can be forgotten by the public. The actions of the tabloid press are brought to bear here, how a scoop can make or break a journalist's reputation, regardless of who might be hurt in the process or even if the truth is ever reported. This is a series that continues to evolve and improve with each succeeding book." - Special thanks to guest reviewer Betty of The Betz Review for contributing her review of Deep Waters and to Poisoned Pen Press for providing a copy of the book for this review. Review Copyright © 2009 - Hidden Staircase Mystery Books - All Rights Reserved. "Callie Anson, curate of All Saints' Church in London, and her beau, Mark Lombardi, a family liaison officer, get caught up in a high-profile investigation in Charles's engrossing third ecclesiastical mystery (after 2007's Secret Sins). When the baby daughter of a celebrity couple from a reality TV show, Jodee and Chazz, dies in her cot, the subsequent autopsy raises enough questions to bring Det. Insp. Neville Stewart back from his honeymoon, much to his bride's fury. Since Jodee and Chazz live in Callie's parish, Callie becomes involved in arranging the funeral. Mark does his bit to help the bereaved family, but finds himself distracted by his own troubles after his brother-in-law dies of an apparent heart attack. A realistic conflict arises between Mark's devotion to his family and his love for Callie. A tabloid journalist's drive for status heightens the drama. Charles combines credible characters and a puzzling mystery with a tantalizing look at the world of reality TV. (Mar.) "- Publishers Weekly. Copyright © Reed Business Information, a division of Reed Elsevier Inc. All rights reserved.